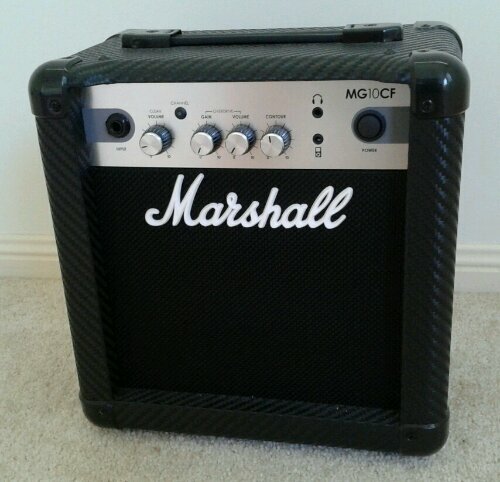 I recently purchased a Marshall MG10CF amplifier as a practice amp. I have a Roland Cube 15XL in the living room, but when my wife is watching TV and the kids are in bed, I am not able to practice in the living room. I guess I could always drag the Roland amp to the other end of the house, but it is much easier just to have a second amp to plug my guitar into. I considered getting a VOX amPlug headphone guitar amp, but I figured for not much more money I could get a more versatile piece of equipment. Besides, the VOX headphone amp requires batteries, the Marshall does not. 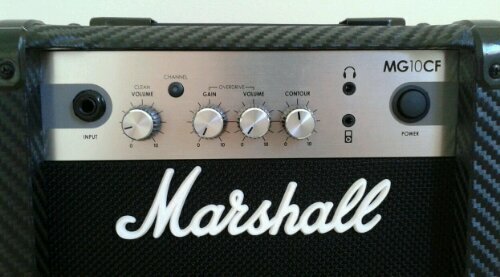 I must confess, I am a little disappointed at the sound quality from the Marshall MG10CF amplifier. Even on the clean channel, the sound is distorted. Not so much a desirable overdrive of a cranked amp, but instead a muffled fluttering sound in the background. The muffled, fluttering sound seems to be something built into the amplifier circuit because I hear the same sound when I have a set of headphones plugged into the amp’s output jack. Someone at Marshall must think the sound of this amp is okay, but I don’t. The amplifier has limited controls, as you would expect from an amplifier at this price point. The amp has two channels, clean and overdrive. The clean channel has a volume control. The overdrive channel has a gain and volume control. There is also a contour control — essentially a tone knob. The amplifier has a headphone socket as well as a socket to plug in a MP3 or similar music player. I am not a huge fan of the carbon effect on the case. It is a hardy plastic case. Do not try to pretend that it is something else. I would much prefer Marshall spent some money on a better quality amp circuit than on the cosmetics of the case. Overall, this is an okay first amplifier for someone learning guitar, but I prefer my Roland Cube-15XL.